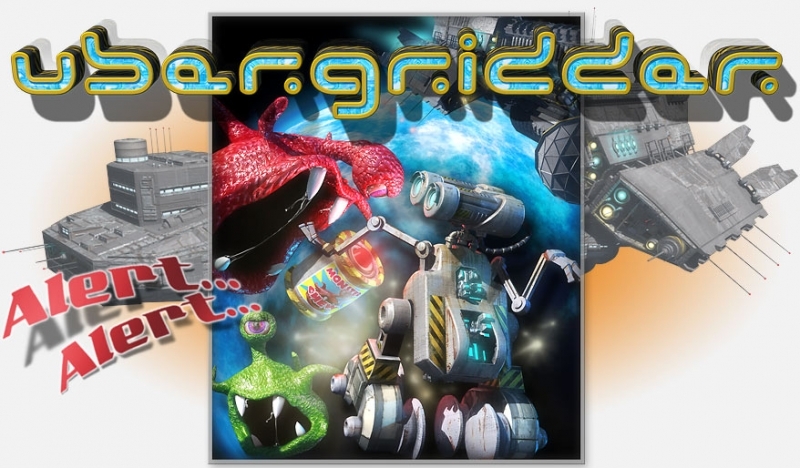 Ubergridder was developed by BadgerPunch Games, and is available for 80 Microsoft Points ($1) under the Indie Games section of the Xbox Live Marketplace. Xbox Live Indie Games are quickly becoming one of the best places to find retro-inspired games from the arcade and NES era. One of these latest games is Ubergridder, a maze-chaser that features gameplay mechanics similar to Pac-Man, which was a clear influence here for BadgerPunch Games. 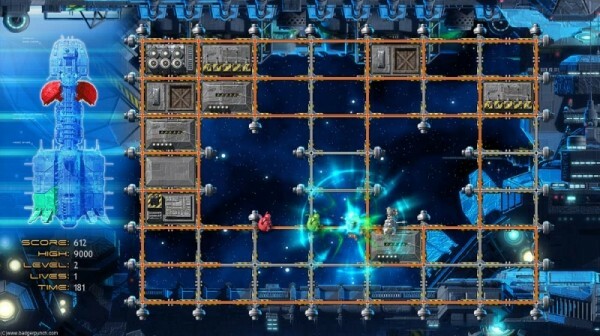 As Robert the robot, players must move along grid lines to repair a busted ship, all while being chased by aliens. It’s not the most original idea, but it accomplishes what it sets out to do. Clean, retro style – It shouldn’t come as a surprise that a game heavily influenced by Pac-Man, one of the simplest and easily recognizable games ever, has a nice, clean retro look to it. Ubergridder’s simple WALL-E aesthetic is easy on the eyes and trouble-free to navigate. The way it plays is also similar to Pac-Man, and is something anyone can pick up and understand how to play from the get-go. Relaxing, sci-fi soundtrack – Ubergridder’s music is surprisingly relaxing and listenable. 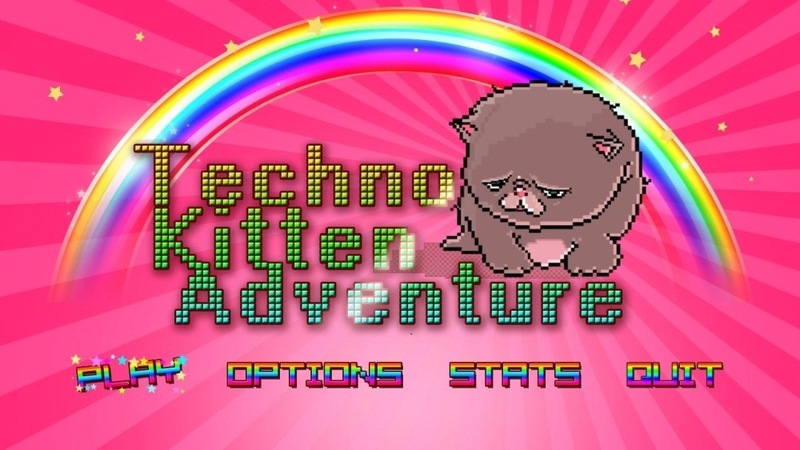 The chill beats and relaxing melodies are very good for an XBLIG. Not that anyone should be expecting something terrible, but the music is worth mentioning and is easily above average for an indie game, or a proper XBLA game for that matter. The artist’s music can be found at xerxes-music.com, and is a recommended listen if you find the music in Ubergridder to your liking. Only a dollar – Even though it goes without saying at this point that most XBLIG’s are only a dollar or so, that price really is hard to beat. Even if you don’t play Ubergridder, there are plenty of indie games to choose from, many of them very good. If you’re tight on cash this holiday season and can’t afford to buy any retail or XBLA games, XBLIG are definitely the way to go. 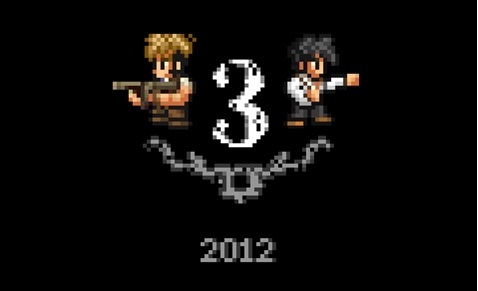 Ubergridder is a justifiable game for only 80 MS points, and at the very least, you’ll get some cool music to listen to. 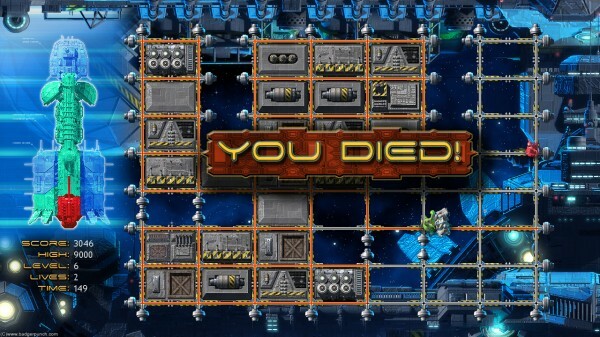 Imprecise controls – Ubergridder’s controls can be frustratingly imprecise at times. While you can blame this mostly on the Xbox 360’s crappy D-pad, it becomes problematic when you have to tell Robert the robot to make a turn before he comes to an intersection in the repair grid. Essentially, you have to preload each turn before you come it, meaning that if you get in a pinch and try to make a turn at the last second it usually won’t work, and you’ll end up moving to the next intersection and making the turn then. This results in either retracing your steps to repair a line or turning right into an alien and dying. Difficulty spikes early – Ubergridder can be a tough game, and the difficulty spikes upward early. While part of that difficulty is because of the occasional imprecision of the controls, the game is still quite a challenge. The AI seems erratic at when it will decide to chase you. There are times when the aliens will ignore you and just move back and forth repeatedly over a line, leaving you to repair lines at your leisure, and then suddenly turn on you and hunt you down. It’s enough to catch you off guard and force you to make split-second decision at times, something the controls don’t always allow. Ubergridder accomplishes its goal of being a good Pac-Man-inspired game, but this is sort of a problem in of itself. Neither game is deep or interesting for long periods of time in this modern day, which is part of the reason why Pac-Man was reinvented with both Pac-Man Championship Edition and the recent Championship Edition DX. While XBLIG don’t always match the quality or graphical prowess of similar titles on XBLA, their focus on gameplay and fun are what separates them and what we will remember them for. Ubergridder is a decent distraction for those looking for some old-school style gameplay, and while it isn’t very deep, it is definitely worth the $1 price tag.